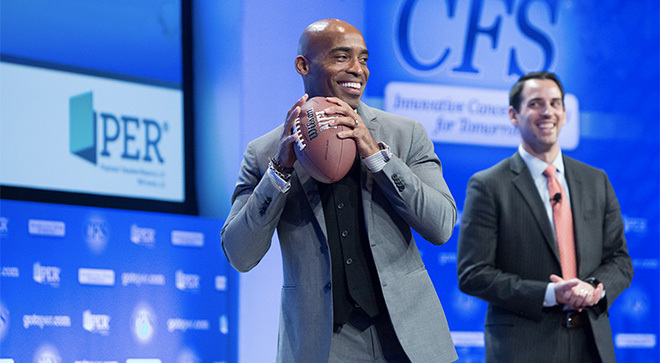 Tiki Barber is best known for his time on the field, playing as a New York Giant for 10 seasons. He holds almost every Giants rushing record — total yards, rushing yards and rushing attempts — and is second in rushing touch­downs. His football career landed him a spot in the Virginia Sports Hall of Fame. But Barber and his twin brother, Ronde, who also played in the NFL for 16 seasons with the Tampa Bay Buccaneers, were sidelined by their mother’s breast cancer diagnosis in 1995. In an interview with Heal ®, Barber relives the moment he got the call and describes the strength he found in his mom, Geraldine. Heal®: What was it like to learn that your mom was diagnosed with cancer? Barber: This was a difficult time for me and my brother, because we were away at the University of Virginia, going into our third year, and we (got) a call from my mom telling us that she had breast cancer. And ultimately, she had to have a double mastectomy. It was terrifying for us because she was everything — our mother, our father, our mentor, our inspiration — and the thought of possibly having to live our lives without her was terrifying. But my mom is strong. She has always been that way. My mom just knows how to get things done, and she told us, “I have to get busy living or get busy dying.” It was inspirational in a way. And she fought it, and she pushed through hard. She came to our game the week after she had her double mastectomy — obviously, against her doctor’s orders. The chemotherapy was hard, but she was a trouper. She is now 22 years a survivor, and that inspires me. It was scary then. It is still in the back of my mind, but I’m inspired by my mom’s journey. 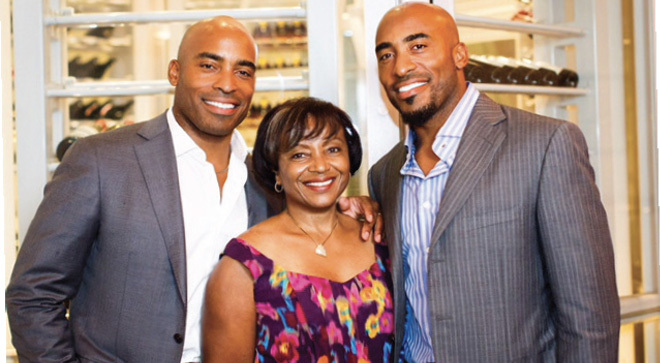 TIKI BARBER with his mother, GERALDINE, and brother RONDE. When did you know that your mom would be OK? I knew my mom would be OK when she attacked this just like I would have attacked an exam or preparing for Florida State — anything we would do on a regular basis — with the vigor and the energy, the understanding and the details it takes to prepare for anything in life. That’s how she attacked her cancer. When she started articulating those things to us, we knew that she was going to be fine. Did having a family member with cancer change the way you approach your health and life? I think (that) in a lot of ways, when my mom was diagnosed with breast cancer and ultimately survived it, it did make me start thinking about what I need to do differently. Obviously, family history is a big indicator of cancer in individuals, so my diet and what I put into my body became very important to me. And after I retired from the game of football, I stopped eating the bad things that I used to eat when I was playing, not necessarily because my mom had cancer but (because) somewhere inside of me, I think that being healthy is the best way to prevent cancer from developing. Are you afraid that you, too, will end up with cancer? I’m not afraid that I will develop cancer. I think that I live a healthy lifestyle, but you never know. I don’t think my mother expected to be diagnosed with breast cancer. I don’t think that anybody who has come across it expected it to happen, but I think understanding that it can happen is the most important thing — and regularly seeing your doctor and getting your regular checkups. This was some­thing I took for granted when I was a player, because you just had to go see the doctor. But when I retired, I didn’t see a doctor for six or seven years. When I got remarried and had kids again, my wife said, “Make sure you go to the doctor.” And I did, and I’ve been perfectly healthy ever since. Is there anything you believe that oncologists don’t understand about what patients go through? I think oncologists know a lot about the patient experi­ence, but the one thing that I would tell them is that open communication is really important. Even if it feels like you’re sharing too much information, it’s better to have more information as a family member of someone who is going through a cancer diagnosis. We all know how the information age works: You start Googling. You start searching and finding things that will terrify you. Information is key. We often talk about the conversation that parents have to have with their kids following diagnosis. Can you describe that conversation with your mother? When my mom called us in 1995 and told us that she had breast cancer, our immediate thought was “OK, we’re coming home.” The University of Virginia was only about two hours away from Charlottesville, so it was close enough for us to get in the car and go. And she stopped us and said, “I’m going to be fine. I don’t want you guys to disrupt your life. You come home when you get free time. There is nothing that you guys can do. We will talk every day. But I got this.” And that confidence that she had made me feel confident. I think she got that confidence from her doctor and her nursing staff around her (who) told her she was going to be fine. It all starts with one positive emotion — one positive thought. It trickles through. What advice would give someone who’s going through a similar experience? If you have a family member who is diagnosed with any form of cancer, talking is the best thing. Sitting in silence is how bad thoughts creep into your mind. It’s how negative thoughts creep into your body. Having conversations and being upfront and open about it is the best thing that you can do. Sometimes that’s hard and scary, but I think it’s cathartic. It helps you start to create positivity. BARBER was the keynote speaker at the 2018 Chemotherapy Foundation Symposium® held in New York City.